Sonoma Valley Teen Services provides resources for teens in the Sonoma Valley to overcome obstacles that arise in their home, work and social environments. Our programs are specifically tailored to empower teens by offering the opportunity to become productive young adults 13 to 18 years old. We offer many opportunities for volunteers who are interested in supporting the teens of Sonoma Valley. Core Programs: The Sonoma Valley Teen Services (SVTS) Core Programs are offered as part of member registrations. Lovin’ Oven: This is a teen run bakery that started In May and has become a huge success. There are 4 founders (Esther, Yazel, Maria C. and Janet) that are actively recruiting new bakers. A new baker has recently stepped forward, Maria Barron. They bake for special parties, events and farmers markets. There is a possibility that you will see them at the Tuesday Night Farmers’ Market. They have a new volunteer named Barbara who will help with development and baking. Daily Healthy Meals: While not necessarily a program, this nightly dinner is prepared either by teens or staff. Dinner is served at 5 p.m. every night. With the exception of Tuesdays-brown baggers brings bagged sandwiches those day. Graffiti Removal: this program was partially funded (supplies only) by The Springs Redevelopment Agency. Depending on teen attendance and weather, staff and up to 9 teens drive around the Springs area and remove graffiti. Bikes Plus+ Program: The teens rebuild and refurbish donated bikes (from the sheriff’s department) into nearly new condition. During this process the teens learn mechanical skills and a sense of accomplishment. The teens are given the opportunity to earn a bike for themselves by donating 20 hours of community service to the Teen Center or one of our sites and 20 hours to our Bikes Plus+ program repairing a bike for someone else. Once the teen has completed his/her 40 hours the teen may then choose a bike to refurbish for him or herself. A recent teen graduate, Carlos Ordaz, volunteers his time and runs this program. Gang Intervention/Prevention Program: SVTS has invited Sunnyhill Services come to the teen center to build friendship, rapport with the kids. Eventually, there will be weekly meetings that coincide with outings to build social skills and experience events/trips the kids would otherwise not have access too. SVTS has also partnered in the past with Life Skills in Santa Rosa, they come as requested to talk about alcohol, tobacco, drugs, gang, etc. The No Name Cyber Café: is a teen-run smoothie café on the Sonoma Valley High School (SVHS) campus employing 10 high school students. Café Attendants learn job skills such as customer service, cashiering, food service, maintenance, marketing and inventory. The Café also provides lunch space for 100 students and a safe place after school for students to hangout, use computers, and do homework until 5 pm. After-school activities such as ArtWednesday; a free-access art studio and free tutoring provided by community volunteers are offered. Teen Safe Ride: provides vouchers for a free taxi rides home for students who find themselves in an unsafe place. Teen Safe Ride currently assists about 20 to 30 students per month. Vouchers are given out in the No Name Café and students are counseled on the risks of binge drinking and drug use. RAD Club (Respect and Dignity): is a teen club that meets after school every Monday to discuss teen life and teen issues as well as completing community service projects and activities. Last year they produced a short film about teen binge drinking and sexual assault. The film was shown in the Sonoma Film Festival and has been adopted as a teaching tool by the Sonoma County Department of Health Services – Prevention Department. The Shop: is a local alcohol and drug free music venue, located on 8th St. East. It is teen run by a board of 10 students. The shop hosts shows including live bands, movie nights, open mic nights and dance parties. The Shop Board books the bands, plans and advertises the shows and runs the event and the food booth. To learn more, visit Sonoma Valley Teen Services. 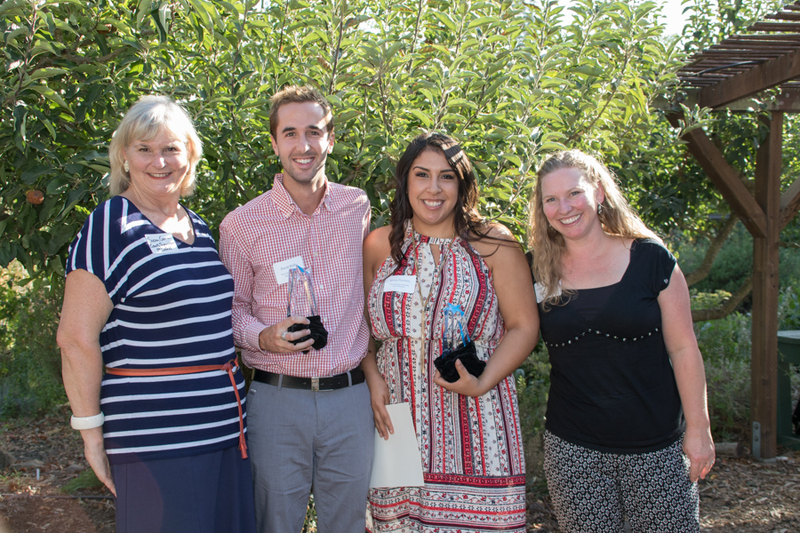 Sonoma Valley Teen Services' Executive Director Cristin Felso (far right) along with Supervisor Susan Gorin (far left) present the Star Awards to Jerica Tercero and David Wells.Jerica and David worked as a team this year to produce the entire live auction for Teen Services Sonoma’s annual Cowboy Cab fundraiser. They networked for donations of items and unique experiences, designed and set up the Cowboy Cab website, produced marketing and advertising materials and created displays used at the event. They gave Teen Services tons of their personal time and helped to more than double Live Auction earnings over the prior year. Jerica and David are this year's volunteer Stars!